Our editor shares some ideas for making floating patterns. One of the hallmarks of an accomplished tier is that all his flies display similar proportions. The hook is a handy tool for measuring the components of a fly. Use the overall length of the hook, the length of the shank, the width of the gap, the distance between the tip of the point and tip of the barb, and so on to measure the length of the tail, the height of the wings, and other parts of a pattern. All your flies will look alike, and when you change hook sizes, you’ll easily maintain the same relative proportions. Do you subscribe to the catch-and-release ethic? In order to facilitate releasing your fish quickly and unharmed, you should use barbless hooks. While the vast majority of hooks are properly tempered and can withstand considerable abuse, sometimes a hook will snap when you are mashing down the barb using a pliers or hemostat; this problem is more common with fine-wire dry fly hooks. If you plan on “fishing barbless,” remove the hook barb before tying the fly; if the hook does break—a rare but not impossible occurrence—you will not waste time or materials tying a fly you will never use. If you tie dry flies using size 8/0 (70 denier) or finer nylon thread, first reduce the tension on your bobbin. Did you even know that a standard thread bobbin is adjustable? It’s very simple to do: slightly bend out the legs of the bobbin to reduce the pressure on the sides of the thread spool. The bobbin should apply only enough pressure to the sides of the spool so that when you release the thread, the tool hangs from the hook without dropping to your bench top, but not so much pressure that you continually break the thread when tying the fly. In addition to tying imitations of newly emerging mayflies, be sure to make a few spinners. Spinners are the egg-laying stage of these insects. A spinner is far less complicated to tie than a dun imitation. 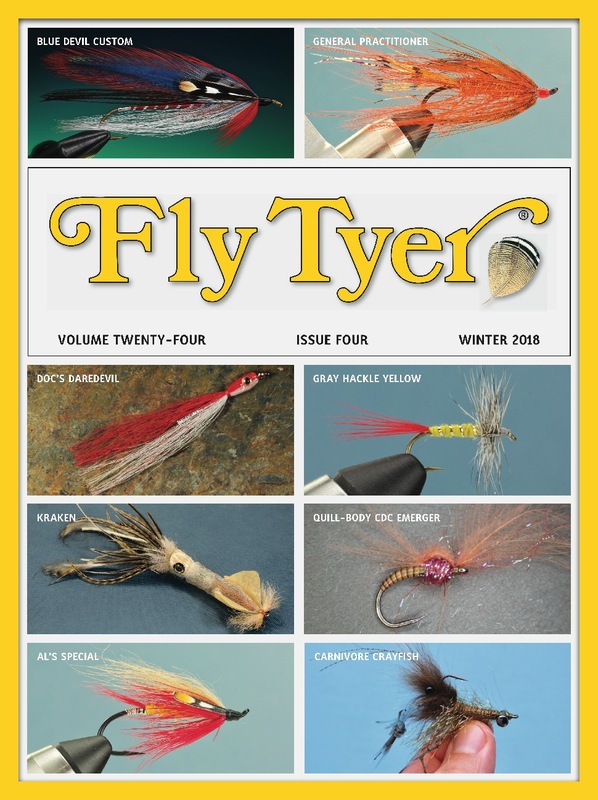 A splayed tail of hackle fibers, a dubbed body, and a sparse piece of polypropylene yarn tied perpendicular to the hook shank yield a fly that matches the outline of almost any real spinner. Fly tying expert Dennis Potter added a small piece of bright yellow yarn to the top of this spinner to make it easy to see on the water. Quality hackles are some of the most expensive ingredients in tying dry flies. A premium cape (a cape is the skin from the neck of a chicken that contains hackles) can easily cost $50 or more. And, if you tie a wide variety of patterns, you’ll need capes in an assortment of colors. But there is a way to use high-quality hackles at a more affordable price. Ask for “variant” colored hackle capes at your local fly shop. If the shopkeeper isn’t familiar with the term, ask to see his selection of grade 3 capes; these are often variants. The feathers on a variant cape contain various shading or speckling; they will not be one uniform color. Because of the uneven shading, these capes are not considered grade 1 or grade 2. The individual feathers on a variant cape, however, are still ideal for tying flies. And, because few insects are solid colors, variant hackles probably yield more realistic-looking flies.